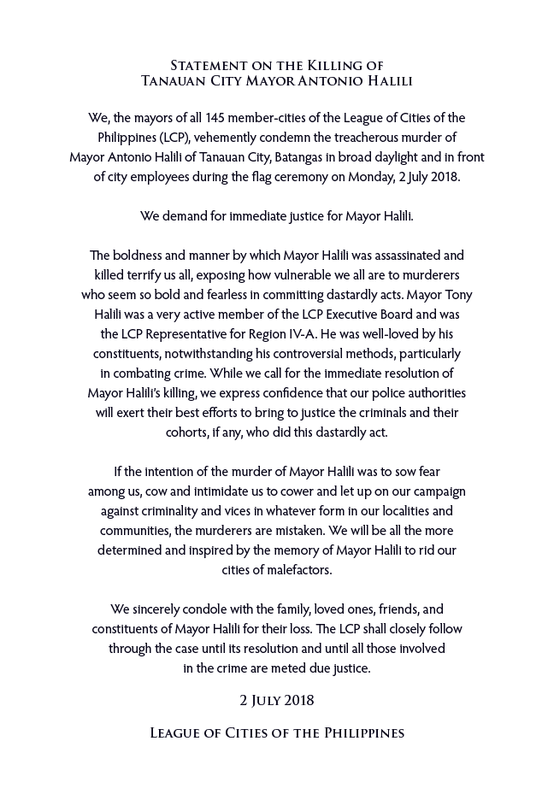 We, the mayors of all 145 member-cities of the League of Cities of the Philippines (LCP), vehemently condemn the treacherous murder of Mayor Antonio Halili of Tanauan City, Batangas in broad daylight and in front of city employees during the flag ceremony on Monday, 2 July 2018. We demand for immediate justice for Mayor Halili. The boldness and manner by which Mayor Halili was assassinated and killed terrify us all, exposing how vulnerable we all are to murderers who seem so bold and fearless in committing dastardly acts. Mayor Tony Halili was a very active member of the LCP Executive Board and was the LCP Representative for Region IV-A. He was well-loved by his constituents, notwithstanding his controversial methods, particularly in combating crime. While we call for the immediate resolution of Mayor Halili’s killing, we express confidence that our police authorities will exert their best efforts to bring to justice the criminals and their cohorts, if any, who did this dastardly act. If the intention of the murder of Mayor Halili was to sow fear among us, cow and intimidate us to cower and let up on our campaign against criminality and vices in whatever form in our localities and communities, the murderers are mistaken. We will be all the more determined and inspired by the memory of Mayor Halili to rid our cities of malefactors. We sincerely condole with the family, loved ones, friends, and constituents of Mayor Halili for their loss. The LCP shall closely follow through the case until its resolution and until all those involved in the crime are meted due justice.